I know they say oatmeal is good for you, but if you’re like me, you’re adding a little something to make that colourless mush just a wee bit more appetizing. A drizzle of honey and some dried fruit like cherries or blueberries goes a long way, but why stop there when you can take it a step beyond? 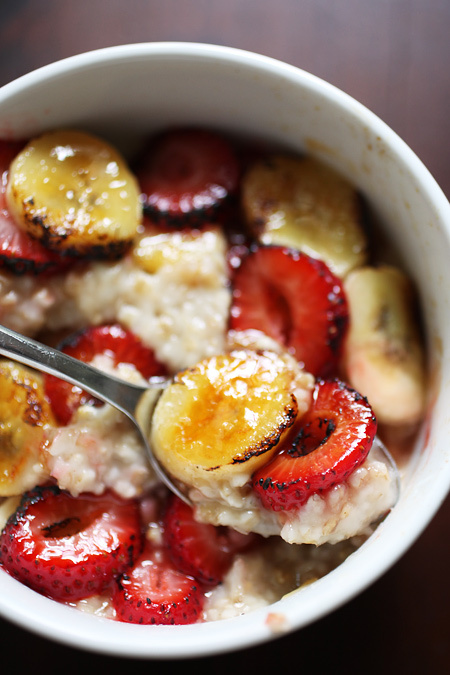 I like to elevate my oatmeal to dessert status. 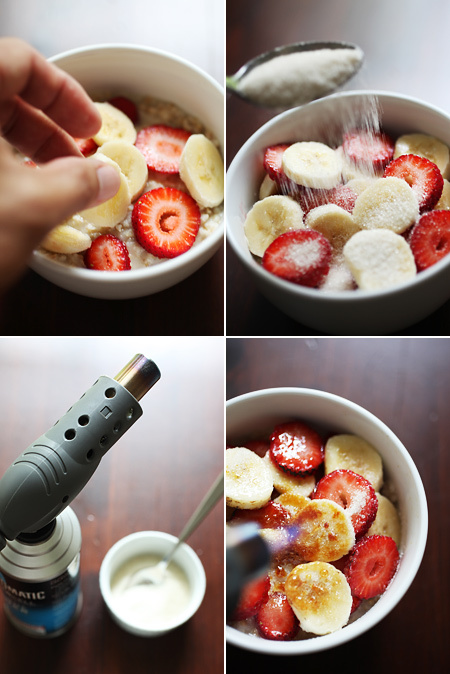 All it takes is a few slices of banana, and in this case some sliced strawberries as well, a spoonful of white sugar (I use organic sugar made from evaporated cane juice, don’t use brown sugar here as it will burn into black clumps) sprinkled over the fruit, and a propane torch for some heat. One thing I’ve learned is to pass up the expensive mini torches you find in gourmet specialty shops and head to your local home center to pick up an industrial torch. An adjustable nozzle with a built-in lighter and a can of propane should only set you back 10-15 dollars, compared to the 30-40 you’ll shell out for the gourmet ones. The bigger flame you get with the Home Depot special will also allow you to evenly caramelize the sugar much faster, and more economically. 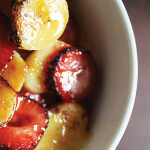 Pass the flame of the torch slowly over the sugared fruit, keeping the tip of the burner about 3-4 inches away. You will start to see the sugar bubble and then turn a golden brown. Keep the flame moving evenly to get a nice brûlée crust. Voilà, dessert — I mean breakfast is ready!